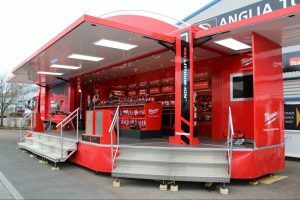 Torton Bodies of Telford in Shropshire build purpose-designed road show vehicles, advertising kiosks and exhibition trailers to meet clients’ particular promotional, advertising or marketing requirements wherever there is a need to take a product or service to the public. 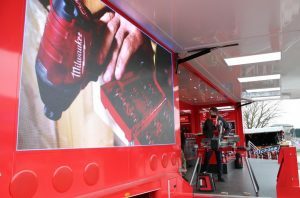 They have recently completed a branded promotional truck and exhibition / hospitality trailer for Milwaukee Tools’ which embarks on an arduous 25 date ‘Road show Tour’ of the UK and Europe visiting trade customers and authorised dealers. Constantly moving forward to take advantage of new materials, new techniques and new technologies, Torton Bodies encompasses a wide range of styles, vehicle bases and ingenious approaches to meet particular client promotional, advertising or marketing specifications. Torton Bodies Managing Director Clive Andrews comments, ‘We’ve been working with Milwaukee now for about 7 years and they came to us with a simple brief, basically to be able to ‘wow’ their audiences whilst demonstrating their extensive range of class-leading power tools – out on the road. Kim Menen at Aqualite commented, “We first got a call from Torton back in 2015 for this project so it’s great to finally see it here in all its glory We think the screen looks absolutely superb and the client is extremely happy with the results. Aqualite Outdoor’s external advertising display screens and monitors are designed with durable waterproof casings, waterproof cables and connections, 6mm toughened glass and an anti glare film and reflective coating for daylight readable, high visibility images outside in broad daylight and bright sunlight. Aqualite are outdoor TV screen manufacturers, suppliers and trade distributors of commercial grade, specialist, IK10 and IP66 rated waterproof and weatherproof TV screens, advertising TV display screens, digital signage TV panels, big LED TV billboards and touch screen TV monitors.